Professional Writing Service – We Are Here to Help You 24/7! PhDWorks.org is a professional writing service. 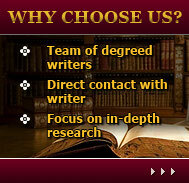 We offer academic writing and editing of the highest quality. The whole process – from ordering to delivering the written paper – has been improving through our years of experience. Today we proudly present you our professional writing services where everything is adjusted to your needs. With PhDWorks.org professional writing services get your perfect paper in just 5 easy steps! From 5 paragraph essay to dissertation – our professional writers can handle everything. Fill in the order form – your personal and assignment details. If you wish a certain writer to work on your order, specify his/her ID. If you need an adjusted writing style you can tell about it, too. Get discounts on next orders from PhDWorks.org professional writing service. Ordering your next custom written paper using your account automatically gives you a 3% discount! After payment confirmation your payment status changes to Paid. Once the writer is found for you, your order status changes to In Process. Keep in touch with our 24/7 professional writing service live support. The order is also sent to your e-mail! Do not hesitate. Choose PhDWorks.org professional writing services! Copyright © 2006-2019 PhDWorks.org. All Rights Reserved. If you use an assignment written by PhDWorks.org writers, it should be referenced accordingly.